It was another I, Me and Myself day. 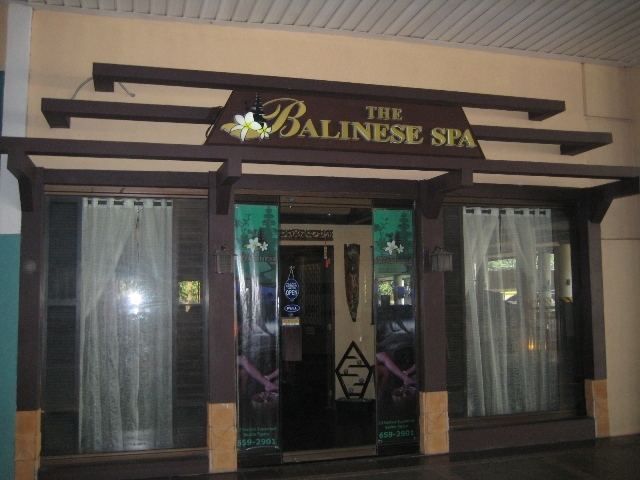 After my car registration, I went straight to Festival Mall to purchase a few items at Healthy Options, but because I ended up in the covered parking area, I accidentally saw (again) the The Balinese Spa which is sitting at the entrance. This suddenly brought out the spa-holic in me. So my visit to Healthy Options was deferred until later that afternoon. It was almost 11 a.m. so I thought it was fine to have the massage and then lunch afterwards. The spa has two couple’s rooms and one single room only. I didn’t pay much attention to the interior design of the spa maybe because the whole area seemed squeezed in. Everyone, however, will never miss the Buddha wood carving prominently hanged on the end wall of the alley. I opted for the signature massage which costs Php550. After a few minutes of waiting at the lounge, I was led to my room which is the biggest so far among the spa rooms I had been to. Sitting on the batik-lined bed was a set of blouse and shorts, also in batik (cloth which traditionally uses a manual wax-resist dyeing technique). I liked it! There is only one separate shower room and one toilet for women. Both are quite spacious but I wondered how the spa-goers will deal with the limited number of shower room and toilet during peak times. I knew the answer. The spa was really small with only one (1) single’s room and two (2) couple’s rooms. One good thing is this spa has a dry sauna (my favorite spot in every spa) that can accommodate around 5 persons at a time. The whole massage was basically Swedish-like – lots of kneading and gliding. Relaxing, but I could not distinguish the difference from other types, if there was any hint of Bali style in it. I forgot to ask my masseuse. Like other spas, after the massage, you will be offered either a complimentary pot or a cup of tea. The overall experience was satisfying. I guess that’s the magic of touch, esp. if your masseuse is good. I walked out of the spa in a state of euphoria, oblivious (again) of my stresses in life.